On 23 September, at the Shenzhen International Biotech Leaders Summit in China, BGI revealed that it would start selling the pigs as pets. The animals weigh about 15 kilograms when mature, or about the same as a medium-sized dog. The institute quoted a price tag of 10,000 yuan (US$1,600) for the micropigs, but that was just to “help us better evaluate the market”, says Yong Li, technical director of BGI’s animal-science platform. In future, customers will be offered pigs with different coat colors and patterns, which BGI says it can also set through gene editing. 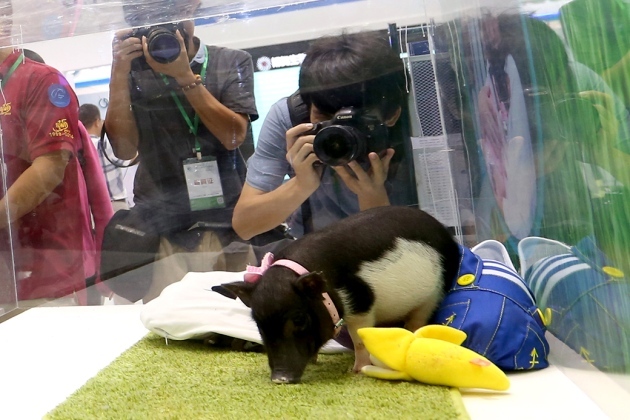 In the United States, reports have surfaced of people who wanted a porcine lap pet, but were disappointed when animals touted as ‘teacup’ pigs weighing only 5 kilograms grew into 50-kilogram animals. Genetically-edited micropigs stay reliably small, the BGI team says. The far larger and more important focus will be cloning cows to help China deal with a growing appetite for beef. Currently the Chinese favor pork and consume just 5 kilograms (11 pounds) a year of beef per capita, half the global average and one-tenth what Americans consume. But the population is acquiring a taste, so Xu wants to “expedite the production of high-quality beef” through cloning. In 2014 researchers were reporting cloning success rates of eight out of ten but in 1996 it took 277 attempts to create Dolly. Cloners will not just be targeting high production cows but superior and currently rare meat. The ideal rib eye in the American market is a marriage of opposites: It’s richly marbled with internal fat to give it flavor, but it has only a thin layer of the back fat that no one wants. In the parlance of the U.S. Department of Agriculture, it’s both “prime” and “yield grade 1.” Cows that produce such beef are rarer than nose tackles who are great dancers. Only three carcasses in 10,000 make the grade. USDA scale for meat quality has 3 levels – Select, Choice, and Prime. Contrastingly, the Japanese grading system has 12 levels, 7 are above the USDA Prime. Today roughly 3% of the traditional US cattle grade as Prime. Transgenic cows can be used for medical research. Cows can be used to produce interferon in the 10,000 gallons of milk they generate each year. Transgenic pigs can be used to produce human organs for transplantation or research. Hwang may eventually clone Panda’s and other rare animals. They could also clone extinct species. Hwang had an infamous controversy in 2004 and 2005 where poor oversight had resulted in claims of cloning of a human embryo that proved to be false. Hwang does plan to get permission to return to cloning human and research on human stem cells. Hwang Woo Suk runs the only facility [Sooam Research of Korea] on earth that clones dogs for customers willing to pay $100,000. He led the team that cloned the first dog in 2005, and he’s produced more than 550 cloned puppies since, increasing the efficiency of a complicated process to a point where he can guarantee an exact genetic copy of a client’s dog, provided he has healthy tissue to work with. Tibetan mastiffs, a breed of ancient, aloof guard dogs so hallowed in China that owning the best specimens is an assertion of status almost without rival. The donor of the cells used to clone these puppies was an 8-year-old champion stud from Qinghai province whose owner turned down a $5 million offer for him last year. He can earn nearly that much in one breeding season. Earlier this year, a developer paid $2.6 million for a single, gold-colored puppy, and a scarcity of top-quality puppies in China means that the run on mastiffs costing more than mansions is unlikely to abate anytime soon. Beyond the symbolic importance of the breed, Chinese officials wanted the operation staged in Weihai because it provided a backdrop for the announcement of a partnership between Sooam and BoyaLife, a fast-growing Chinese biotechnology company with 28 subsidiaries and operations in 16 provinces. Sometime early next year, ground will be broken for a 667,000-square-foot research laboratory on a spectacular plateau of yellow grass and scrubby pines facing the Yellow Sea. There, scientists from both companies will operate China’s first commercial animal cloning facility on grounds landscaped to look like a park. In 2013, an Oregon team led by Shoukhart Mitalipov appears to have used SCNT (Somatic Cell Nuclear Transfer) to clone human embryo that can be used as a source of stem cells. BGI in China is cloning pigs on an industrial scale with 500 pigs per year. Transova Genetics is reported to be producing hundreds of cow clones each year in Iowa.